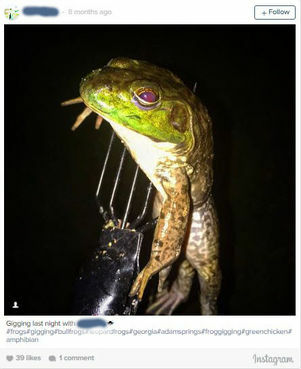 "Gigging" is a form of hunting that involves stabbing small animals with pitchfork-like spears, causing the victims to endure slow, agonizing deaths from shock, organ failure, or blood loss. Students and locals in DeKalb County, Tennessee, are being encouraged to "gig" up to 15 frogs each as part of a fundraiser to benefit two graduating high school seniors. This sadistic event is scheduled for June 24, so the sooner you speak up, the better. Tell the Tennessee Farm Bureau Federation and DeKalb County School District officials to cancel this cruel event immediately! "3,818 supporters have taken action. Let's get to 5,000." Noted & signed! Thank you, Evelyn! This is just disgusting! Noted, signed---nothing like school spirit!! Done via newsletter. What is wrong with people??? Thank you for speaking out against this barbaric event! Signed > Thank you for speaking out against this barbaric event! Thanks Evelyn for putting this horror story up, signed and noted!! And thanks to all those who signed. Isn't this a "proper" way to educate children re compassion and empathy and respect for all lives?! Later they go on torturing and killing human beings and then we're all in shock! So disgusting and despicable! "Thank you for speaking out against this barbaric event!" Done. Thank You for sharing, it must be stopped, this is real horror.
" 6,410 supporters have taken action. Let's get to 10,000." Come ON, C2NN members - can't we mobilise more?